WAB: What's After Boot Camp? Gunny Wolf from SemperToons has created this cartoon that features a D.I. 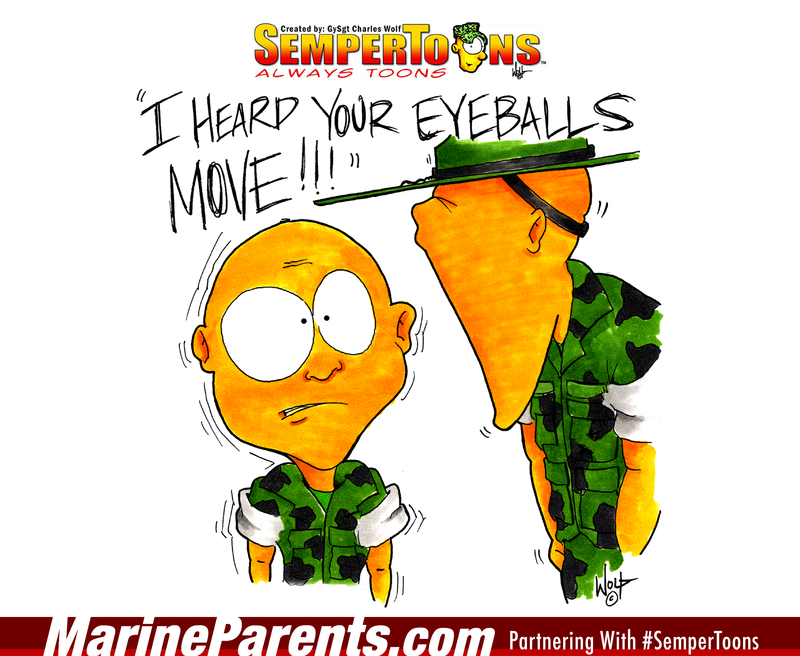 yelling at a Marine recruit the words, " I HEARD YOUR EYEBALLS MOVE!". Shop Eyeballs Move SemperToons at the EGA Shop. MarineParents.com, Inc., was founded nationally on January 21, 2003 to provide support, information, and services to Marines and their family members, and create opportunities for the public to support our troops through the organization's outreach programs. In over 16 years of service, Marine Parents has made a huge impact in support of Marines, military personnel, and their family members. For those with a loved one in military service, you are not alone. You've found Marine Parents, a Place to Connect & Share®. We've been supporting Marines and their family members across the nation for more than 16 years. MarineParents.com, Inc., is an IRS-approved 501(c)(3) public charity eligible to receive tax deductible donations. Use the red menu bars below to learn more about our outreach programs, support services, online store, and a place to connect & share®. Whether you need our support or you'd like to support others, you'll find what you're looking for with our outreach programs. Together, we support the troops and their family members. Hover over an icon to learn more; click an icon to go to the website. We have information and services for every stage of the Marine Corps career. is owned and operated by MarineParents.com. Purchase your Marine Corps clothing, recruit graduation items, and gifts where 100% of the proceeds support the outreach programs of the organization, an IRS-approved 501(c)(3) public charity. The EGA Shop is an Official Marine Corps Trademark Licensee. It's not just a trademark. It's our mission. Click a link below for a Place to Connect & Share® with other recruit and Marine Corps family members. MarineParents.com, Inc., an IRS-approved 501(c)(3) public charity eligible to receive tax deductible donations, was founded on January 21, 2003 to provide support, information, and services to Marines and their family members, and create opportunities for the public to support our troops through the organization's outreach programs. Copyright © 2003-2019 MarineParents.com, Inc. / All rights reserved. Marine Parents a place to connect and share® is a registered trademark of the United States Marine Corps. Used with permission.